Cyndi - it sounds like to need to dispute the value directly with the investor. I just recently received a notice from Wells Fargo that they want to net $253,000 on a property that I have an offer on for $140,000 and obtaining a rehab loan for the additional $30,000 that it would take to hook up to sewers. At the final end, it would then be high retail for the property. The property does not comp out even close to $253,000. This is MORE than what the owner purchased it for in 2007 (at the peak of the market). Not only that, the property now has a failed septic system and cannot be repaired as the area has sewers available now. Property cannot be transferred without a certification from the State. The buyer would only come up $10,000 so Wells Fargo closed out the file. Anyone with expertise that can give me some suggestions? I hear there is a Wells Fargo Preferred Agent Program. I qualify per Mike's webinar today. My Well's Fargo loan officer doesn't know who to contact though to forward his referral. Any ideas how to proceed are appreciated. Happy Holidays. I would love to hear the stories from Paddy. 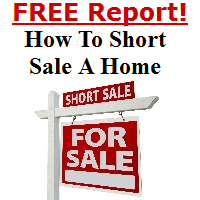 I have experience borderline trespass and breaking and entering in my short sales in Denver. Giving sellers foreclosure and short sale advice should include the consequences of moving out and what can be done about it. Do you work in Fl? Awesome info, Irene. Thanks so very much. Hopefully they have one in Maryland! Celeste - here is the info on one of the Home Tender companies. I am presently using them in a listing that I have since the renters moved out and the sellers live out of the country also. It is wonderful to know that the property is being well taken care of. This company is very on top of things. Thanks. I will do some research. Thanks for sharing.